I've been meaning to update with some new photos but I haven't taken any pictures lately except the last couple of days I made a conscious effort to do so. So now I'll have to make an effort sometime to upload them here. Soon, I promise. I never did get my floor mopped, I'm thinking I'm going to have to hire someone to come in one a week just to do my floors. Wouldn't that be heaven! It'll get done eventually maybe when the youngest is four or something! Oh well. I've been slowly getting things done. My garden is now planted, I just need a damn hose so I can water the thing instead of carry bucket so water from the house everyday. I tell ya that's fun! I'm getting some nice muscles on my arms. I'm just happy the garden is planted. It's a little late this year so we shall see how things turn out. My dad started all my plants this year for me except the usual I start from seed: carrots, potatoes, peas and onions. But my tomatoes and peppers are already doing well. Other things that got planted this year are corn, pole beans, lettuce, zucchini, cabbage, broccoli, cauliflower and some kale. i think my dad said he put some rutabaga or something like that in there as well. I guess we'll see as the summer progresses. Not much has really progress around the house. They still haven't finished moving that pile of gravel that's been sitting my driveway the last two weeks. I'm not too concerned about the fence just yet, the kids know not to go to the river and to only play where we can see them. If Bubba is outside, I'm usually with him and that is a lot. He loves to be outside. House will be painted at some point. I'm thinking I need to finish going through my crap, so I can have a yard sale but I really don't want to, hubby doesn't care either way but really don't want to. I think it might be I just don't want to sit around for a couple of hours whilst people poke around at my stuff, if I just take it to the free store I won't have to deal with that but on the other hand money is always good even a few bucks right? So maybe if I can spend an hour or two over this next week I'll do it this weekend. Now I'll have to make signs! Kids are doing great having a grand ol' time this summer swimming, riding bikes, daycare/daycamp, wiener roasts, cousins visiting, lots of friends to play with and lot' s walks. Buddy is having a time of it, he keeps tripping in the gravel and cutting up his hands and knees and he had one really bad fall a couple of weeks ago and his tissues keeps opening up everytime he falls now so it's just not healing properly. We are keeping an eye on it for sure. SmartGuy is doing really well at daycamp. He had a few trying days as soon as school was out but after having talks with him, he seems to be doing well. Today he also starts Art Camp and we've been working on an incentive for him to have a treat at the end of the week if he's had a good week at Art Camp. He's really enjoying his summer and being outside, already darker than i am and I put sunscreen on him! Bubba is getting teeth like crazy. He got the two top ones in and then immediately another top one and a bottom one popped in. So six all together now and two more on the way to even things out. He's quite the toddler these days into and on everything. He's doing really great sleeping in his own bed for most of the next. Though last night he came to me at about 1:30 and at 4:30 he fellout of my bed and landed on his head. Poor thing, luckily he had no bumps or bruises but for some reason he pushed himself over the pillow I had there that was blocking his falling off, I guess it didnt' work. I'm also working on weaning him which he isn't liking very much but he is accepting water or rice milk in a sippy cup at bedtime. Hubby is busy at work for 12 hours a day and I'm busy with work and kids 24 hours a day. They do sleep and I just either veg in bed with a book or do housecleaning. Lot's of fun stuff, I tell ya! Now that I've added the garden, well let's just say I'm tired. Good news is that I've not had a cigarette. I'm gettina handle on my eating and exercising everyday. I'm feeling good and I just can't wait to see some results. I'll go into more dets in another post. I just found your blog and have enjoyed reading. I like your way of writing. I don't have a blog because I'm too lazy but do enjoy reading a few others. 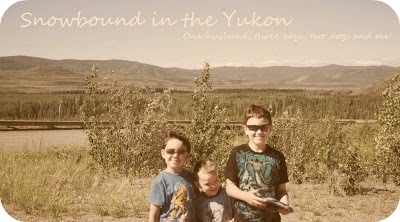 Are you really in the Yukon? Thanks so much for your comment. Yes, I really am in the Yukon. It's a beautiful place! I hope you continue to enjoy reading.